Ollie attended the press night of Beauty & the Beast at CW Entertainment with his mum Nikki. We all had a fantastic time and thoroughly enjoyed the pantomime, here is Ollie's own review. 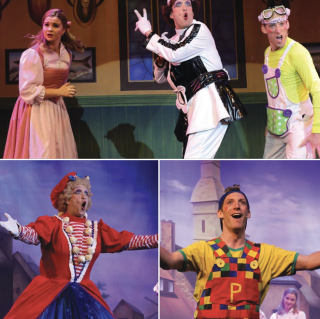 Beauty and the Beast is a family friendly pantomime at the Campus West theatre in Welwyn Garden City. After having my picture in front of the big sign and seeing all the great light up items being sold we went to find our seats and wherever you sit is a great view! All the characters were so good at their roles, the main characters, Beauty and the Beast (Prince Louie), were really good but my favourite was Pano, he was really funny! There was a good choice of songs and the dancing was really fun to watch. There were lots of jokes throughout the pantomime, for adults and children, and the actors really got the audience involved which was great. The fairy narrated the story of Beauty and the Beast as it went on. Definitely go and see this pantomime if you haven't already because I laughed the whole way through. My favourite part was the dancing skeletons and if you're sitting near the front make sure you take a waterproof!